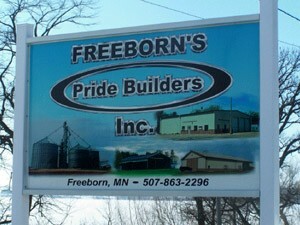 Freeborn’s Pride Builders long history in the rural construction industry at this location started in the early 60’s selling buildings and grain handling. Known as Stensrud Agribuilders then, it was sold in 1977 to Bill Kirchoff when it changed to Steel and Grain Structures. During these early years, both Steve Kalis and Dale Ladlie worked here. In 1990, with the sudden death of Mr. Kirchoff, Freeborn’s Pride Builders was started with Steve Kalis and Dale Ladlie as the new owners. Through the years, steady expansion in personnel and equipment has taken place to keep Freeborn’s Pride Builders the regional leader in the metal building, grain handling and storage market; the primary area covered being a 70-mile radius from Freeborn. In 2006, with the retirement of Dale Ladlie, Tim Beyer and Laine Ladlie joined the business as co-owners. Additional staff is available to help with all of your needs.